In the Basic panel, press-and-hold the Shift key and double-click directly on the Whites slider, and then do the same for the Blacks slider. This automatically expands out the whites and blacks to their farthest points without clipping the highlights (well, that’s the plan. Occasionally, the whites do create some minor highlight clipping), which expands your overall tonal range. If you’ve used Photoshop in the past, you might remember doing this same type of thing (though not automatically like this), but we used to use the Levels dialog to do it, and it was called “setting your white and black points.”This is the same thing; it’s just automated (which is awesome). You might want to consider making this the ﬁrst thing you do when you start to tweak an image, because you’ll be starting with an expanded tonal range.Then, you can go back and tweak your Expo- sure amount (making the overall image brighter or darker), once the white and black points are set. While there isn’t just one slider that does this, the closest one is the Exposure slider ((found in the Basic panel). It doesn’t cover the darkest areas (blacks) or the brightest whites), but it covers the all-important mid tone range (and then some). So when it comes to exposure, it has the biggest overall effect on your image. 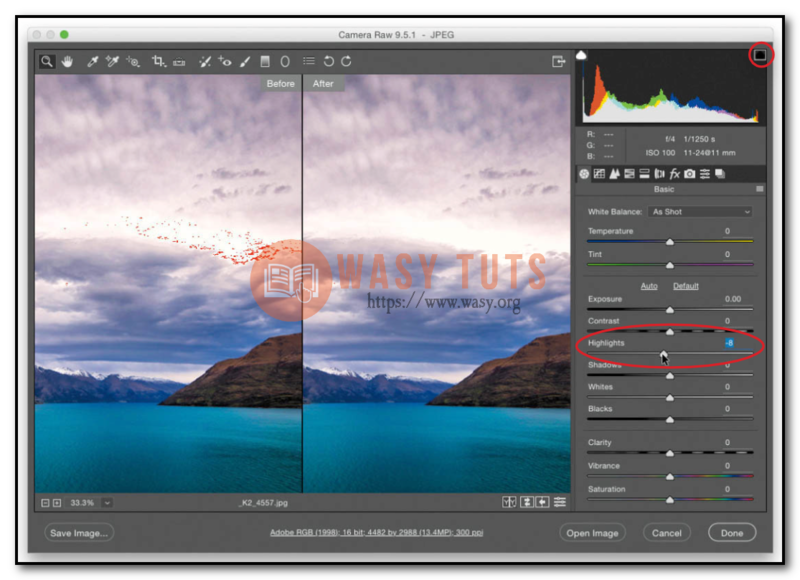 In earlier versions of Camera Raw, there wasn’t an Exposure slider. Instead, this slider was called “Brightness”, and it controlled the overall brightness (although the math has been updated since it was Brightness). But, knowing that old name helps give you some idea of what this slider mostly does—it controls the brightness. Drag it to the right, your image gets brighter; drag it to left, it gets darker. In the Basic panel, drag the Highlights slider to the left until the white triangle up in the top-right corner of the histogram turns solid black. If you have to drag it way, way over to the left, it will start to affect the overall look of your image too much. So, if you ﬁnd yourself having to drag it way over to the left, ﬁrst try lowering the Whites slider a bit and see if that helps (that way, you avoid getting the “over-edited” look that you get from dragging any slider in Camera Raw all the way to the far left or far right). If that doesn’t work, and you are still clipping the highlights, another thing you can try is lowering the Exposure slider a little bit. If your photo looks kind of ﬂat (especially compared to the image you saw on the back of your camera when you took it), one of the best quick-ﬁxes is simply to increase the amount of contrast by dragging the Contrast slider (found in the Basic panel) to the right.This does a number of things, besides just making the darkest areas of your image darker, and the brightest areas brighter (which is pretty much what adding contrast does), because it makes the colors in your image appear much richer and more vibrant, and our eyes perceive a more contrasty image as a sharper image, as well. 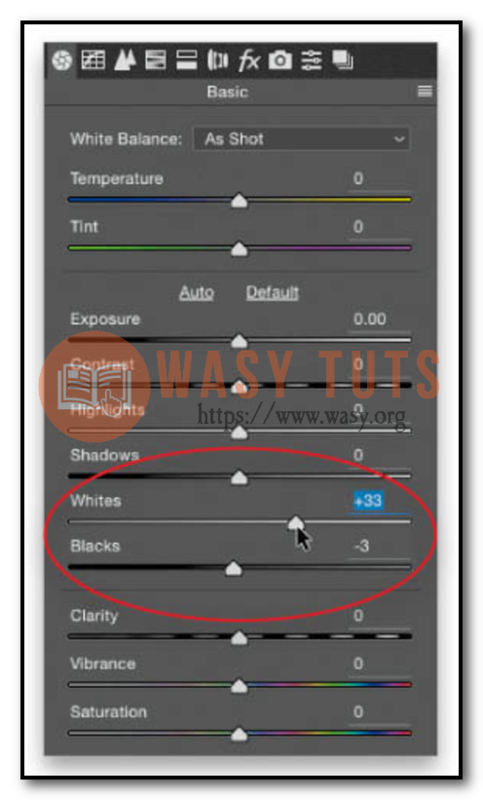 Personally, I just use the Contrast slider, but if you feel you need more control, or more “juice” than just this one slider will provide, you can go to the Tone Curve panel and either use one of the Point Curve presets from the pop-up menu, or you can make the shape of any of those “S-curve” presets that have more contrast by clicking-and-dragging the points until the “S-shape” is steeper (the steeper the S-shape, the more contrast it creates). This Tone Curve contrast is stacked on top of anything you’ve already done with the Contrast slider, so you can go contrast crazy (once again, I rarely ever have to use this Tone Curve method because the Contrast slider by itself is actually very good. But, if you get in a low-contrast situation, at least you know another place you can go to get more). In the Basic panel, just drag the Clarity slider over to the right and any texture in the image gets immediately enhanced. Keep an eye on the screen as you drag this slider because if you drag it too far, you’ll start to get a black glow or halo around the edges of objects in your image, which is warning you that you’re editing this image to death. How far you can go with it really just depends on the image, images like landscapes, cityscapes, automotive images, anything with lots of very well-deﬁned hard edges can take lots of Clarity. Other images, like portraits or ﬂowers or things of a softer nature, can sometimes take very little. 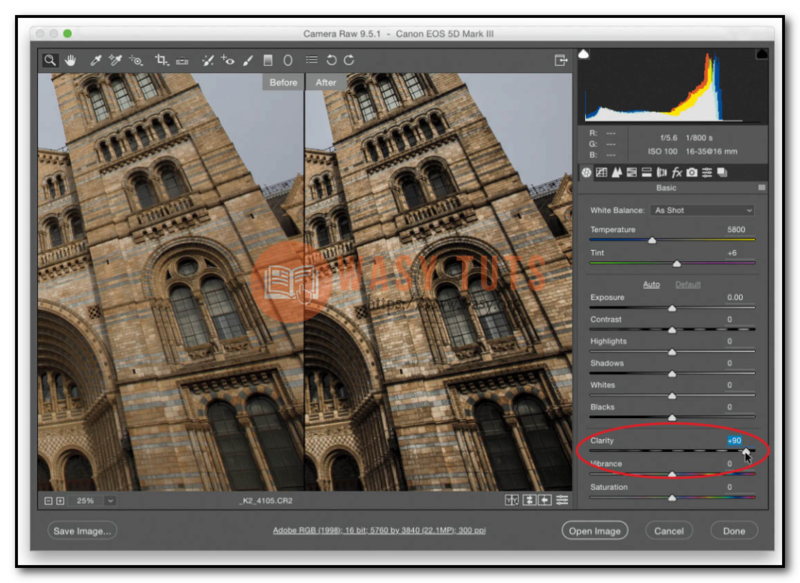 Get your white balance right and everything else falls into place.There are three ways to do this: (1)Try the White Balance preset pop-up menu (at the top of the Basic panel). By default, the menu is set to As Shot, which means you’re seeing the white balance as set in the camera when you took the shot. Click on that menu and a full list of white balance choices you could have chosen in-camera appears (the full list only appears if you shot in RAW. 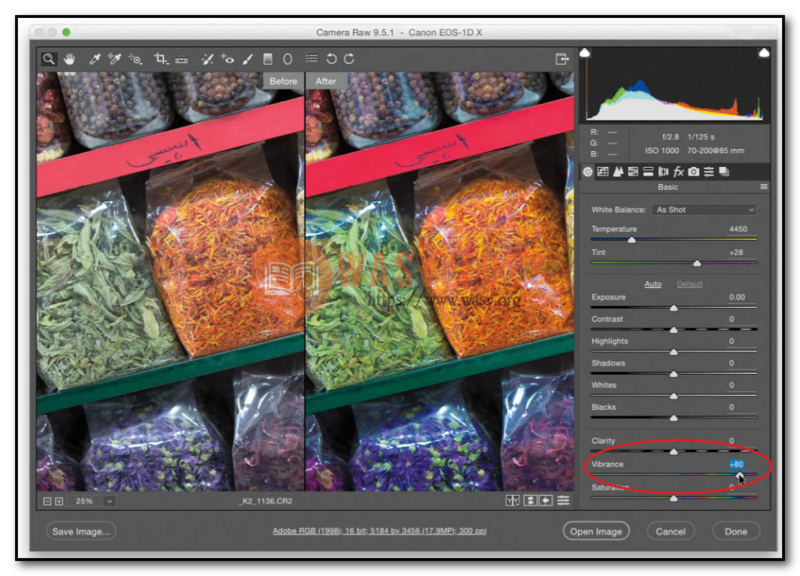 If you shot in JPEG, you’ll only see As Shot, Auto, and Custom, and by the way, custom means “do it yourself by moving sliders,” so it’s really not a preset). Choose the preset that best matches the lighting when you took the shot. If you choose one that precisely matches the lighting situation (e.g., you shot in an ofﬁce with ﬂuorescent lights, so you choose Fluorescent), but it doesn’t look good, just pick a different one.Who cares about the name? Choose the one that looks right to you. (2)The second method is to get as close as you can using one of those presets, and then tweak the color using the Temperature and Tint sliders.The sliders themselves show you which color is added by dragging one way or the other, so drag the slider toward the color you want more of (for example, dragging toward yellow gives you a warmer look; dragging to- ward blue gives you a cooler look). (3)The third method is my favorite: get the White Balance tool (I; the eyedropper in the toolbar at the top of the window), and just click it on something light gray in your image (as shown above). If there’s nothing light gray, try and ﬁnd something neutral (not too dark, not too bright, not too colorful). Don’t touch the Saturation slider—that will just make your image look too colorful. You just want “more colorful,” which is why you want the Vibrance slider (found in the Basic panel) instead. It’s kind of a“smart color booster” because when you drag it to the right, it makes any dull colors more vivid. It hardly affects already vibrant colors (which is good), and it tries to avoid ﬂesh tones altogether, so it doesn’t make people in your photos look sunburned or jaundiced. It’s also good for desaturating just a little bit if you have an overly colorful image—just drag it to the left a bit. Click on the HSL/Grayscale icon under the histogram (it’s the fourth one from the left). When the panel appears, click on the Saturation tab (“HSL” stands for Hue, Saturation, and Luminance), then go to the toolbar, at the top of the window, and you’ll see a tool whose icon looks like a small target with a + (plus sign) at the top left (it’s the ﬁfth one from the left). That’s the TAT (Targeted Adjustment Tool). Click on it to activate it, then move it out over the area in your image that has an individual color you want to boost (or desaturate, for that matter)—like a blue sky or green grass or someone with a yellow shirt—and just click-and-drag it upward to increase the amount of that color (and any associated colors. For example, the sky might be made up of not just blues, but aquas, as well. It knows and will move both sliders for you automatically as you drag). Click- and-drag downward to reduce the vibrance of that color.To change the brightness of the colors, click on the Luminance tab, then click-and-drag the TAT downward, and the color gets deeper and richer. If you want to actually change the color (for example, you want that yellow shirt to be green), ﬁrst click on the Hue tab up top, then click-and-drag the TAT up/down until the color changes to what you’re looking for. Note:This doesn’t just change that one color in that one area, it changes all the similar colors in the image. So, if you have a blue sky, and your subject is wearing a blue shirt, know that both the sky and the shirt will change when you make an adjustment to one of them.